Microsoft Blackshirts March On Rome? Labels are very important. I spend a lot of my time thinking about what things should be called and how they are labelled. Some people say I am obsessed. I believe that the naming of things is one of the most important things that Information Architects can do. 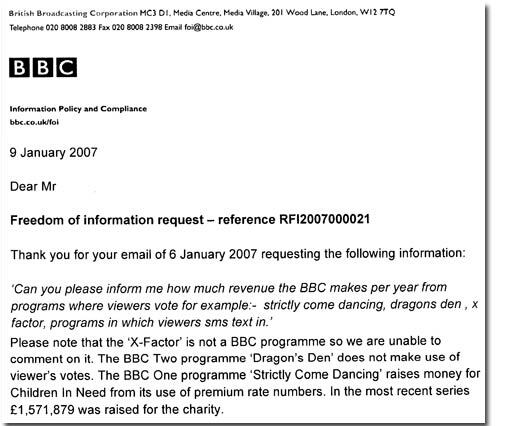 Question : "Please can you inform me how much revenus the BBC makes from programs where viewers vote for example:- strictly come dancing, dragons den, x factor, programs in which viewers sms text in." Answer: "Please note that the 'X-Factor" is not a BBC programme so we are unable to comment on it. The BBC Two programme 'Dragon's Den' does not make use of viewer's votes. The BBC One programme 'Strictly Come Dancing' raises money for Children In Need from its use of premium rate numbers. In the most recent series £1,571,879 was raised for the charity. Original Letter from the BBC. Couldn't this person have spent five minutes on Google rather than forcing some poor sod at the BBC to waste an hour of their time responding to this stupid question. What about the fourth age of an information architecture? I am interested in what happens when an IA framework has been implemented and the fuss has died down. Did the IA's leave behind a sustainable framework that could be maintained without a lot of manual rework or did they leave behind an impressive artefact that would start to fall apart if you tried to change it in any way? I am a programmer who tries to build software as if people mattered. I have spent al lot of my spare time over the last decade writing software that allows me to explore connections between people and ideas (userati, jos, webword, bookrank, alertbox , bloglines etc). In my day job I have been building tools that allow people to build, maintain an award winning intranet used by almost 20,000 people. Recently I have been trying to expose the hidden maps behind some well known web sites: Simply Google and Simply BBC. I have been following the design of the BBC News site for many years by reading the blogs of people such as Martin Belam, Karen Loasby, Damian Rees, Matt Jones, and Jem Stone amongst many others. I use the BBC News site almost every day and have become intimate with the navigation options available. As I often use my PDA to browse the news site I use the low graphics version as much as the normal version. I am wondering if the people who look after the news site have stopped caring about the jewel in the crown of BBC IA or perhaps they just don't have the proper tools to do the job. Here is an example of the poor manner in which the navigation of the news site ie being maintained. The first 14 items give the top level news categories. The next item is a special one that links to the video and audio page. The final section provides links to some special sections like the week in pictures and the magazine. Four of the fourteen news category links contain 2nd level category lists as well (World, Business, Health and Education). It has the same 14 top level news options and the same "Video and Audio" special link. But why bother with this link for the "low" navigation version as it doen't actually provide links to any video and audio content? But when you look at the "low" version you just get a link to a help page. Perhaps the BBC team wanted to keep the two navigation systems consistent and didn't want some options appearing in the high version that didn't also appear in the low version. But if you look at the last section of items in the navigation lists you see that that cannot be the reason. The high version contains links to 5 items of which only 2 appear on the low version (Have Your Say and Magazine). The "In Pictures" item doesn't appear in the low version navigation list but a very good low version of the section exists that allows you to see all of the weeks pictures without having to use the annoying "Back Next" version. There is also an extra item called "Programmes" that only appears on the low version of the category list. After a quick search I did find a link to "Programmes" in the high version that only appears in the menu when you select the "Country Profiles" option. The Programmes section was obviously superseded by the Video and Audio section, but someone forgot to update the navigation menus properly. There is a new area for News and Current Affairs programmes. It now forms part of the Audio/Video page which you can find a link to on the left-hand side of the News site. This page will no longer be updated. You are also asked to "Update Your Bookmark/Favourites". Perhaps they should tell Karen Loasby about this change as well as us poor web users. The menu on the left is the correct one, but the old version on the right appears when you select "Country Profiles". It looks like these menus have to be manually updated whenever an IA wants to change the navigation system. I have built a number of systems that are used to manage navigation and search systems on intranet and internet sites and I always ensure that I provide a "change once / update everywhere" tool that ensures consistency across the site. This problem of inconsistent navigation is a symptom of an organisation that does not take maintenance seriously enough. There is obviously little or no testing when changes are made and I can only assume that if this most basic type of testing is not carried out then there isn't much hope that anyone thinks about the wider implications of these apparently simple navigation changes. 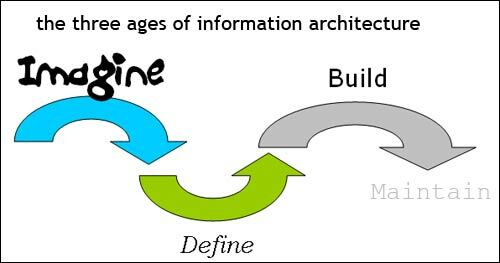 If the Information Architects don't take the fourth age of IA seriously then their only legacy may be broken navigation systems and mis-spelt page titles. Maintenance may be the boring end of IA but it may turn our to be the most important for the poor users. PS. I have found a few other problems with inconsistencies between the hi and low versions of navigation but I am sure that a simple review by someone on the BBC team will find these.